This is one of those times where branding has left me confused and uncertain about something that, on the face of it, I should be instantly in love with. I generally adore Vietnamese coffee; I honestly can’t think of a single one I’ve tried that has disappointed. 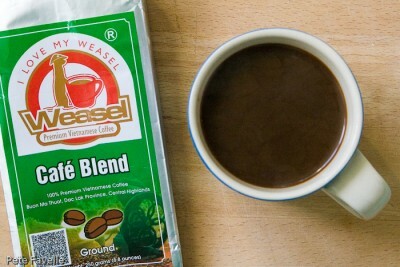 And yet, I’m uneasy about the whole ‘weasel coffee’ thing – not because I object to the idea of eating something plucked out of weasel poops (although…) but due to the animal welfare issues that such production raises. So what am I supposed to make of Weasel Coffees, with their tagline of “I love my weasel”? Are they saying that they’re weasel friendly, shunning the weasel poop? Or are they saying how much they love their weasel poop? Their website suggests it’s neither; they just like the story of weasels. Two of their blends contain “a small amount” of weasel coffee – although it’s not exactly easy working out which two, as only one mentions it – but mostly it just seems to be about putting a cute fluffy creature on the packet. After all that, Weasel Cafe Blend doesn’t seem to be one of the blends with that “small amount” of weasel coffee in it, so I can enjoy it guilt-free. It’s a blend of 100% robusta beans, but don’t let that put you off. The grounds are a deep, dark brown with a wonderful chocolate aroma; it’s not as sweet-smelling as some Vietnamese coffees, and there are hints of old, hot wood and even some caramel. Brewed, the chocolate notes are lost, with the caramel aroma coming through much stronger. In the mouth it’s rich without being strong; a subtle edge of bitterness like properly dark chocolate and a slight oily feeling – indeed, rinsing the Aeropress even feels faintly greasy with this coffee. There’s also an odd, slightly powdery texture, like cheap hot chocolate. The actual flavour is nice, but the odd mouthfeel distracts – there are better Vietnamese coffees out there. 2.5 stars.